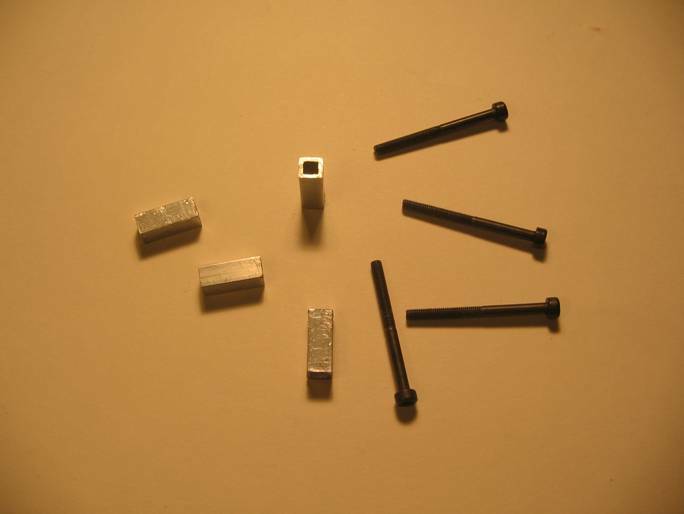 Alu or plastic spacers 10mm long x 3.5mm inside dia. 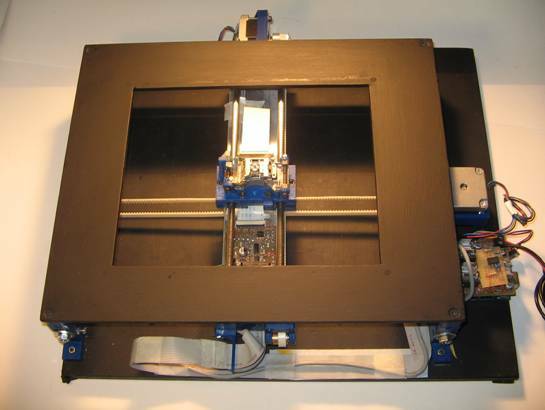 The printing bed supports the window glass through which the laser will sensitize the PCB. 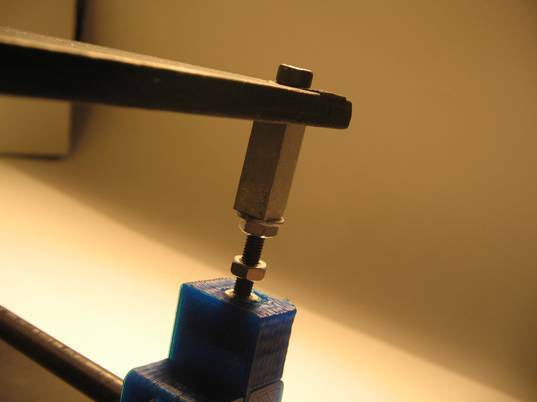 It's bolted on top of the printer framework using four M3 x 35mm screws. 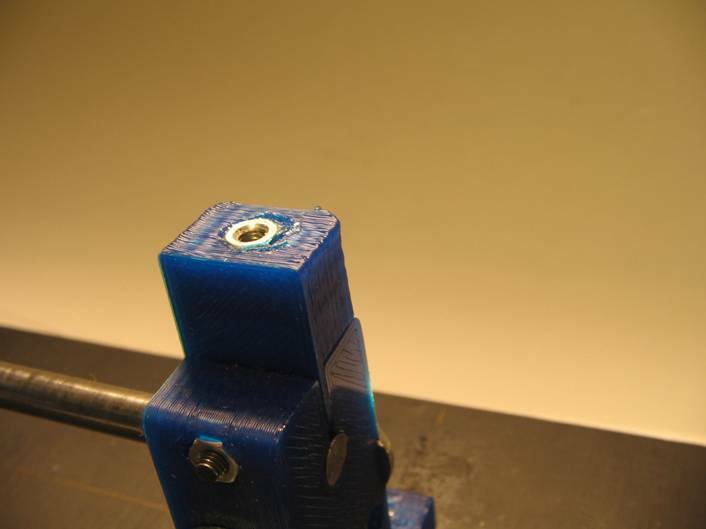 Before you install the printing bed you need to cut four 10mm long aluminum or plastic spacers that you will use to install the four bolts of the printing bed. Put the printing bed on the top of the printer and check that the holes are drilled correctly and coincide with the Printing Bed Supports holes. Install the glass. 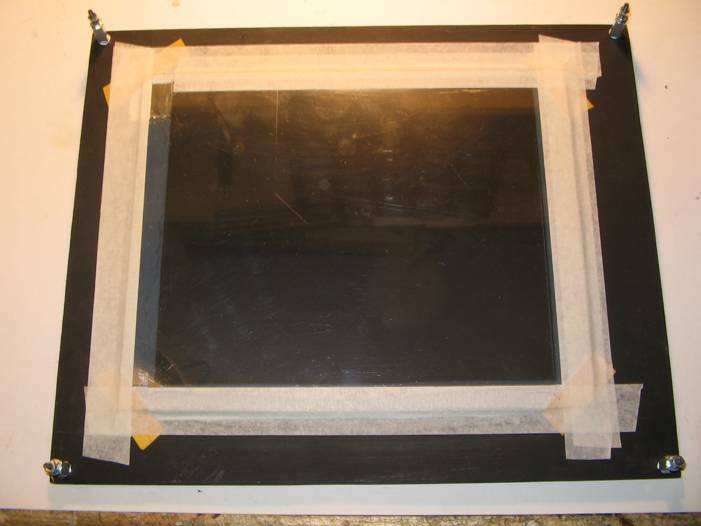 Paste it to the underside of the printing bed with a few pieces of double-sided adhesive tape. Pay special attention to one of the corners because you will install there later the reflective alu film of the "Focus Point". 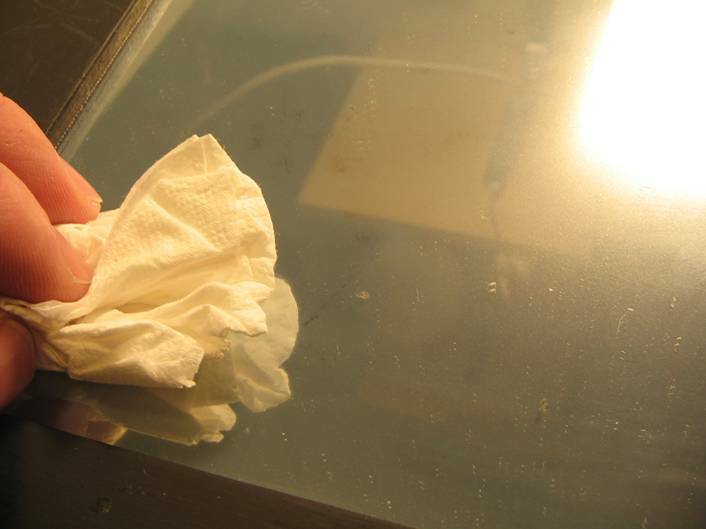 Check that the solar-film face of the glass is upwards and the rectangle of the "Focus Point" on the lower right corner of the printing bed. 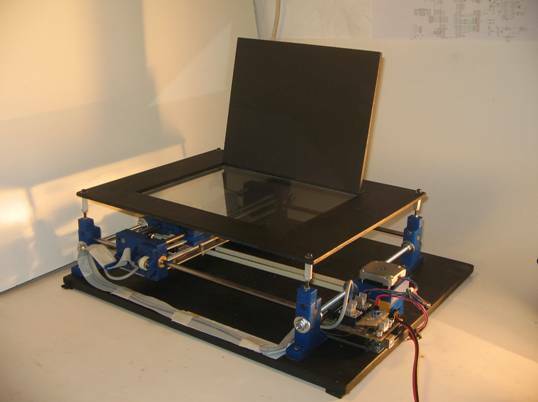 When the printing bed will be installed on the printer, the solar film will face down and the focus point will be on the lower left corner. 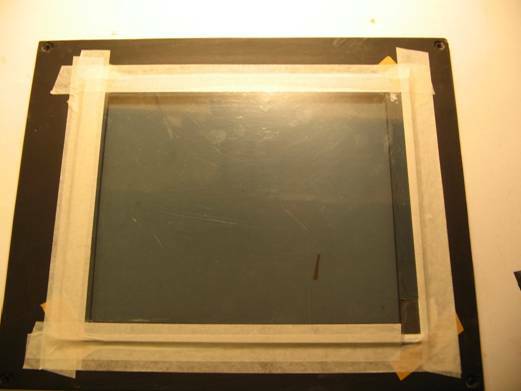 Then remove the protective tape, center the glass on the window and push it against the adhesive tape. 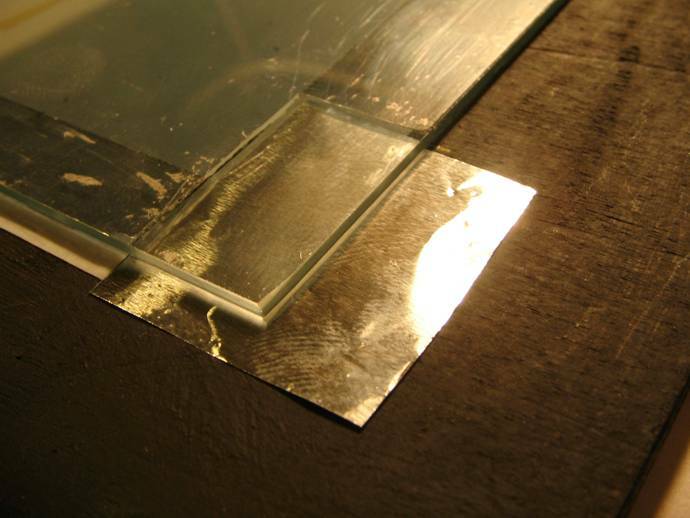 Cut a piece of aluminum foil and introduce it at the "Focus Point" between the glass and the plywood, with the most reflective face upwards. 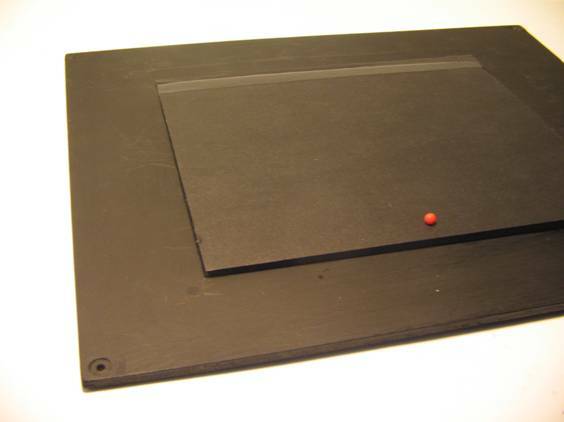 Pay special attention it does not crease or scratch since it will not reflect the laser light and you will have difficulties to focus. It is possible that the foil won't get fixed because is too thin. 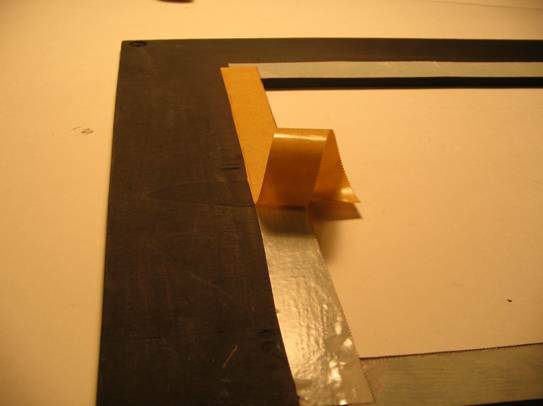 Between the window and the plywood is the double-sided adhesive tape that is thicker than the foil. 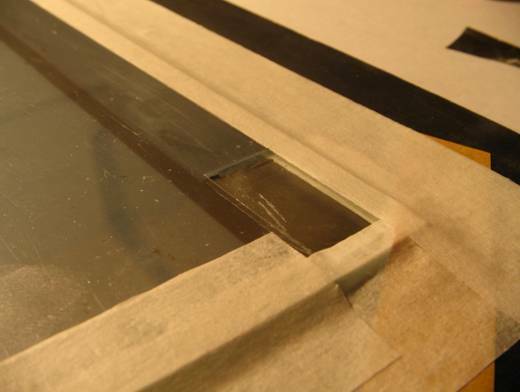 It is important that the reflective paper will fully pressed against the glass without any gaps or kinks. 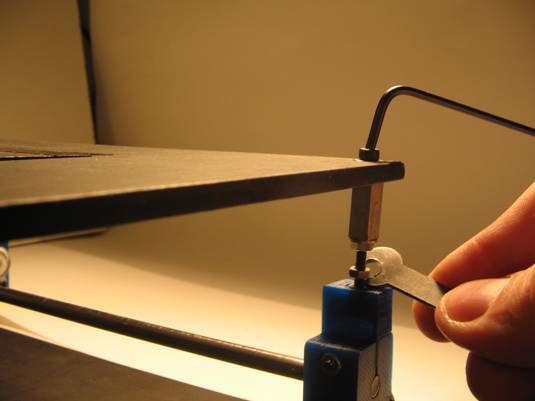 A trick is to bend it several times on itself to make it as thicker as the double-side adhesive tape. Then hold the glass to the plywood along the entire length of its contour with an additional layer of single-sided adhesive tape. 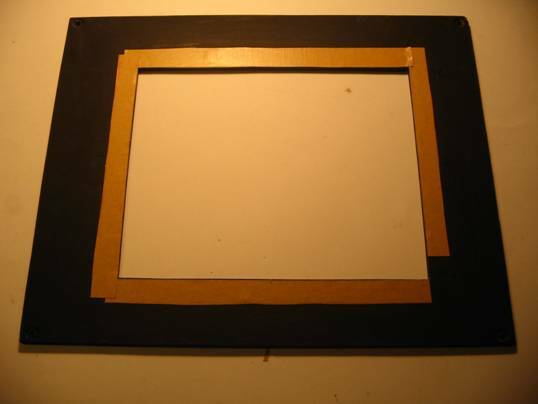 Use also adhesive tape at the corners, taking special care not to cover the "Focus Point". Turn around the printing bed. 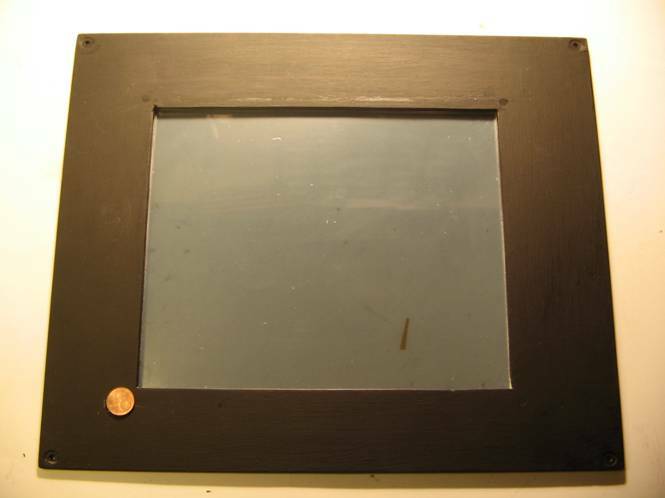 The "Focus Point" will be more or less where the coin is in the next picture. Then you will install the printer door. 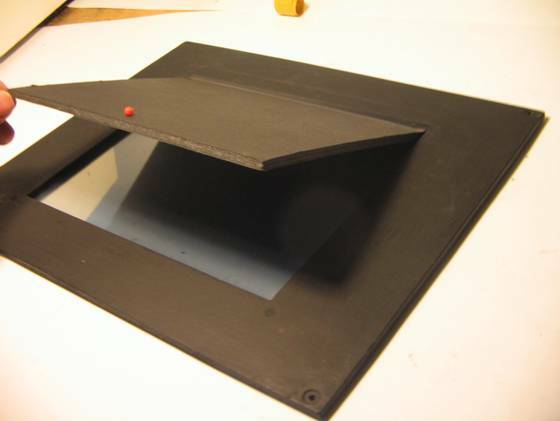 Cut a piece of black adhesive tape and glue it as a hinge between the printing bed and the door. 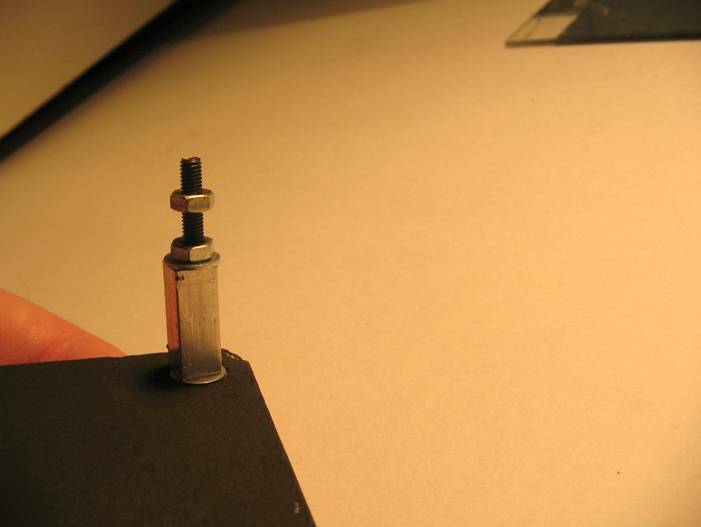 Also glue a pin (or similar) as a door handle, so that you can open it easly. Thread the bolts at the four corners with a washer between the head and the wood. Use another washer, a spacer, other washer and two more M3 nuts at the bottom. 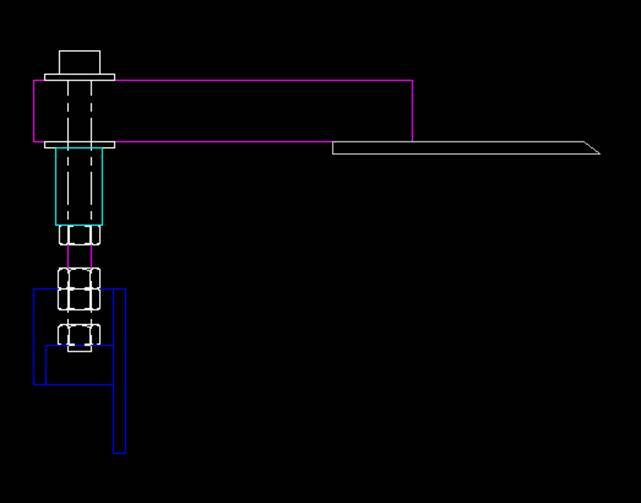 You have completed the printing bed. Clean the glass on both sides with a soft cloth or paper towel, but do NOT use any window cleaner or chemical product to clean the solar film side (you can use it on the other side). 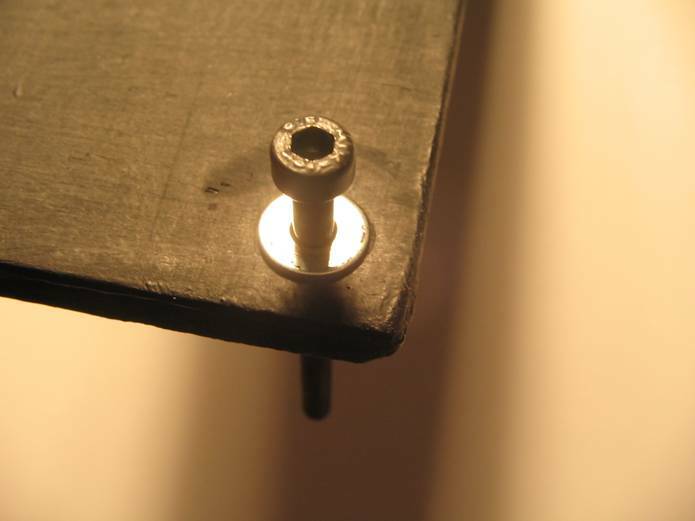 Place the priting bed on the top of the supports and thread the four screws with an M3 allen key. Use also an hex key to hold the nuts. 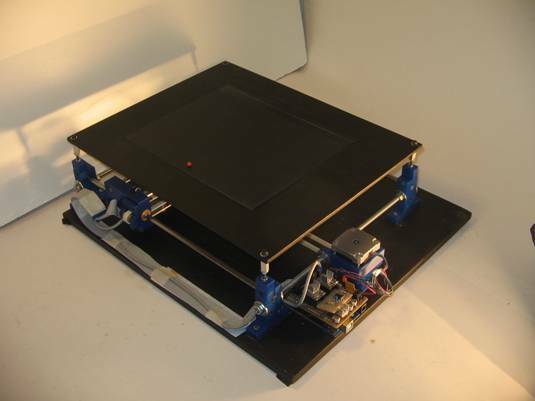 Attention: The installation of the printing bed is provisional because later you will have to calibrate it. So do NOT tighten the bolts yet; the window glass has to be about 10mm from the pickup lens. 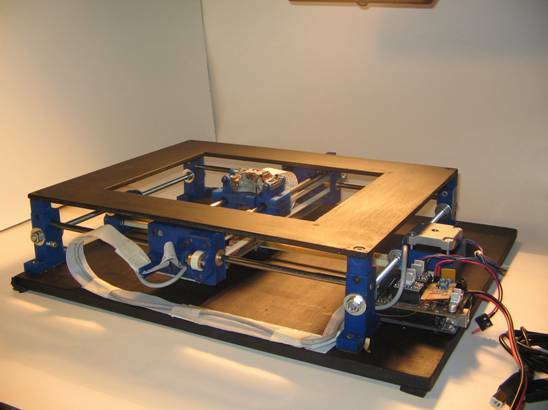 The printer assembly is almost finished and will look like this.